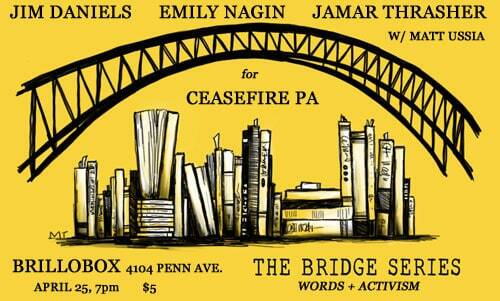 The Bridge Series returned for its exciting second season on Wednesday, February 28 at Brillobox! They’ve made a few changes to the series for 2018 including a bimonthly schedule, an earlier start time (7pm), and a Q&A with their writers after each reading. This season The Bridge Series is the proud recipient of PEN America’s Press Freedom Incentive Fund. As always, each installment of the series will feature Pittsburgh’s finest writers and a special guest organization, with proceeds from the evening going directly to that organization. Their February 28 event featured readings by Brentin Mock (CityLab), Charlie Deitch (Pittsburgh City Paper), and Hattie Fletcher (Creative Nonfiction) along with a Q&A discussion led by Matt Ussia (We’re All Gonna Die podcast)! Their guest organization for the evening was The Coalition for Racial Justice in Media. 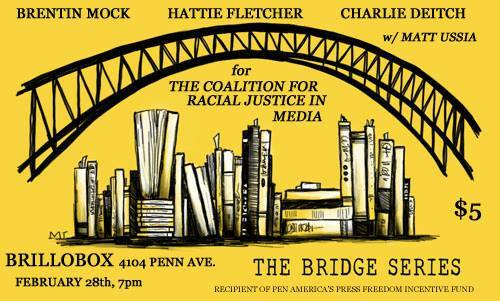 Where: Brillobox 4104 Penn Ave.
Charlie Deitch is the news editor at Pittsburgh City Paper. He began working as a professional journalist at his hometown newspaper in 1993. Since then he has worked in news rooms in Ohio, Pennsylvania, Illinois, Wisconsin, and Louisiana. Hattie Fletcher has been the managing editor of Creative Nonfiction magazine since 2005 and is the editor of the monthly mini-magazine True Story. Essays she has edited have been reprinted in the Best American Essays, the Best American Travel Writing, and the Best Women’s Travel Writing, and have been awarded the Pushcart Prize. She has also worked on books covering such topics as end-of-life care, personalized medicine, education, mental health, and parenting. She was a coordinating editor for the Best Creative Nonfiction series, published by W.W. Norton, and is co-editor, with Lee Gutkind, of True Stories, Well Told: From the First 20 Years of Creative Nonfiction Magazine (In Fact Books, 2014). Brentin Mock is a staff writer for CityLab who writes about the role of justice and civil rights in the laws and policies that govern our lives, particularly in the urban environment. He has a long history of reporting on environmental justice and voting rights. He previous served as justice editor for the environmental news site Grist, and as a national correspondent for Colorlines.com. He has also served as a staff writer or fellow for The Nation, The American Prospect magazine, Intelligence Report magazine, Pittsburgh City Paper, and The Lens, an investigative online news nonprofit in New Orleans, Louisiana. His work has also appeared in The Washington Post, The Root, Outside Magazine, Essence, The Grio, and Next City. Matt Ussia is sentient organic matter, an academic, soft core punk, theremin player, photo-blogger, and podcaster who lives in Pittsburgh. He is currently finishing up a book about the negative impact of neoliberalism on higher education and the lives of young people. 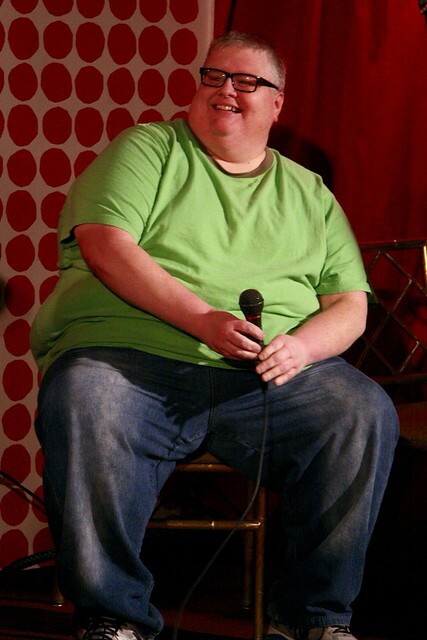 His podcast is called We’re All Gonna Die (And Other Fun Facts). The Coalition for Racial Justice in Media was created to improve inclusivity and accurate, substantive representation in newsrooms by holding newsrooms accountable. CRJM believes that all voices deserve an equal opportunity for access within Western Pennsylvania’s media ecosystem, notably within its legacy newspapers, television, and radio broadcasts and digital operations. Through a combination of advocacy, policy-making, education, research, and reporting, CRJM works toward the creation of such an inclusive media environment. The Bridge Series commemorated the life and legacy of Martin Luther King, Jr. by we observing the 50th anniversary of his assassination. For this event, The Bridge partnered with the creative forces behind Challenges to the Dream: The Best of the Martin Luther King, Jr. Day Writing Awards at Carnegie Mellon University and featured readings by anthology editor Jim Daniels and contributors Emily Nagin and Jamar Thrasher. The guest organization for the evening was CeaseFire PA. After the reading, they held a Q&A moderated by Matt Ussia, host of the We’re All Gonna Die! (and Other Fun Facts) podcast. Jim Daniels edited Challenges to the Dream: The Best of the Martin Luther King, Jr. Day Writing Awards (Carnegie Mellon University Press, 2017). He founded this writing program for local high school and college students 20 years ago. In addition, Daniels is a poet, fiction writer, and screenwriter whose recent books include Rowing Inland, Street Calligraphy, and The Middle Ages. Emily Nagin received her BA in creative writing from Carnegie Mellon in 2011 and her MFA in fiction from the University of Michigan Helen Zell Writers’ Program in 2015. She is a contributing writer at Fiction Writer’s Review and MQR Blog, and her short stories have appeared in the Uncommon Core Fiction Anthology, New Ohio Review, and the Main Street Rag. She serves as fiction adjunct at Pittsburgh CAPA 6-12. Jamar Thrasher is a native of Pittsburgh. He attended the Pittsburgh High School for Creative and Performing Arts. While in high school, he received several honors, including a writing scholarship to Ghana, which inspired his essay, “An Unforgettable Journey,” which was published in the Pittsburgh Post-Gazette and won first place in Carnegie Mellon University’s Martin Luther King, Jr. Day Writing Awards. Jamar founded Kennedy Blue Communications, a public relations firm focused on youth organizations and youth initiatives. A world traveler, he recently returned from Haiti where he profiled aspects of FLM-Haiti. Currently, he is working on Voices from the East End, a collection of first-person interviews about people with connections to Pittsburgh’s East End. That project is a collaborative work with writer Jason Vrabel. Jamar lives in Pennsylvania with his daughter Kennedy. These events were made possible through a grant from PEN America’s Press Freedom Incentive Fund, which supports projects that underscore the vitality of journalism through the impact it has on a range of local issues.